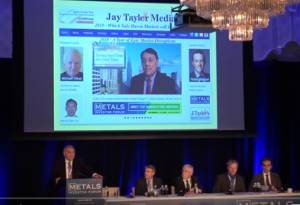 The five companies listed below, all of which are current recommendations in my newsletter, were invited by me (or in the case of Great Bear Resources by another newsletter writer) to the January 2019 Metals Investor Forum in Vancouver. Next to the name of each company are links to both their power point presentation as well as the interview I did with each firm. I’m quite excited about each of these companies, especially now that gold and uranium appear to be entering new bull markets. I hope you will take the time to watch these presentations and interviews because I believe each of them provide great upside potential from their current low prices. Avrupa Minerals (C$0.06 – $7 million market cap) is a project generator with some highly promising copper-zinc projects in Portugal’s Iberian Pyrite Belt. Avrupa recently announced that it had engaged one of the largest North American-based mining company to form exploration joint ventures at the Alvalade, Marateca, and Mertola copper-zinc projects. The probability of good drill results is in my view quite high. Given Avrupa’s minuscule market cap, the percentage upside from here could be massive. Great Bear Resources (C$$2.92 – 105 million market cap) – This company’s new high grade Dixie discovery in the Red Lake district of Ontario has all the markings of another Red Lake Gold mine which was the company maker for GoldCorp. While $2.92 may seem “expensive” compared to many of the stocks in my newsletter, the company has only 36 million well placed shares outstanding. I believed the potential for another “Red Lake” discovery is quite hight and if so, this 105 million market cap could catapult into a billion market cap company. This is one of the most exciting stories I have followed this past year. NewRange Gold (C$0.20 – C$18 million market cap) – New Range’s Pamlico project located on the northern end of the prolific gold producing Walker Lane Trend in Nevada has assembeled a large number of former mom and pop gold mines into one major project. For the first time in history this entire property will be explored using modern technology. Some very high grade results have been reported from surface and from extensive underground workings. The recent addition of former Great Panther CEO, Robert Archer provides a huge personal lift both in terms of technical competence and marketing for an overworked Robert Carrington. Uranium Energy Corp ( US$1.27 – US$225 million market cap) – During 2018 for the first time in many years, demand for uranium outstripped supply and the Trump Administration seems likely to deem uranium a strategic metal required for the nation’s defense. The U.S. produces only about 2% of the 55 million pounds per year consumed by nuclear power plants that supply 20% of America’s electricity. In addition uranium for nuclear powered submarines must be imprted simply because the U.S. produces less than 1 million pounds per year. Uranium Energy is one of the few companies in the U.S. that can turn the switch on and start producing uranium on a moment’s notice from plants in Texas and Wyoming. During the long bear market, management has acquired a large number of ISR projects. As such it is in a position to become the major uranium producer in the U.S. if we are at the start of a major bull market in uranium, the upside for Uranium Energy appears very bright. Meet me at the next MIF!